I’ve been out of pocket for a while. I had a rough year which culminated in the loss of my mom in January and my dad two months later. She was 91 and he was a week away from 85. I’m an only child so there were no brothers and sister’s to cry with… just my husband and kids. I lucked out in that area. My husband stayed with both my mom and dad 24/7 in the hospital after they were unconscious and I’d said my goodbyes. He didn’t want anyone to see the quick decline in their bodies and I agreed. Even my dad let him spend the last few days alone with my mom. Roy took his guitar and played for other patients, the nurses and my parents. He talked to them and smoothed their hair and brows… With my mom it was the 6th day, and she had lasted much longer than the docs expected. Roy said he had just touched her brow and said “I’m still here mom.” and then she took her last breath and passed. My dad came to Roy afterwards and teared up as he thanked him for doing that for us. Then two months later Roy did it again. When I expressed my concern about him being the only one there he said “This is what I’m cut out for.” I’ve never met anyone like my husband. I wasn’t though. It was just the end of a long period of stress and health issues, which were compounded by the frustration of me being all about health… yet here I was, the antithesis of everything I believed I should be. My oldest daughter Jennifer was actually fearful for my life so she swooped in and rescued me. She brought me out to live with her for a few months so I could heal. 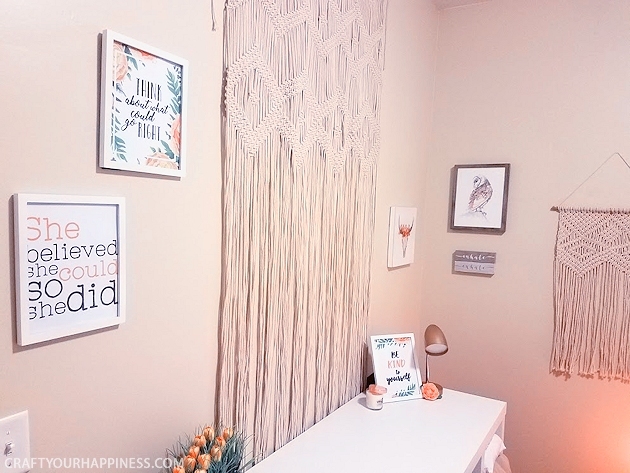 She made up a room for me that was a mini-sanctuary and within a few weeks I was feeling more hopeful than I had for a long time. As she fed me a plant based diet my blood pressure went down 30 points in a week. The extra weight I put on started to come off. And best of all I started walking again. I’d not done that in several years. Sometimes, it’s not the verbal condolences and sadness you need from others at times like this. Sometimes, it’s something that makes you smile or laugh or be incredibly grateful for those around you. 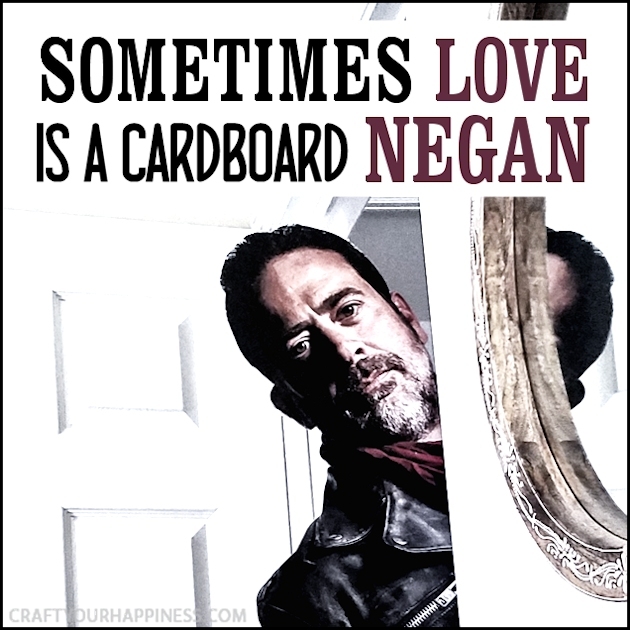 Sometimes, is a cardboard Negan. P.S. 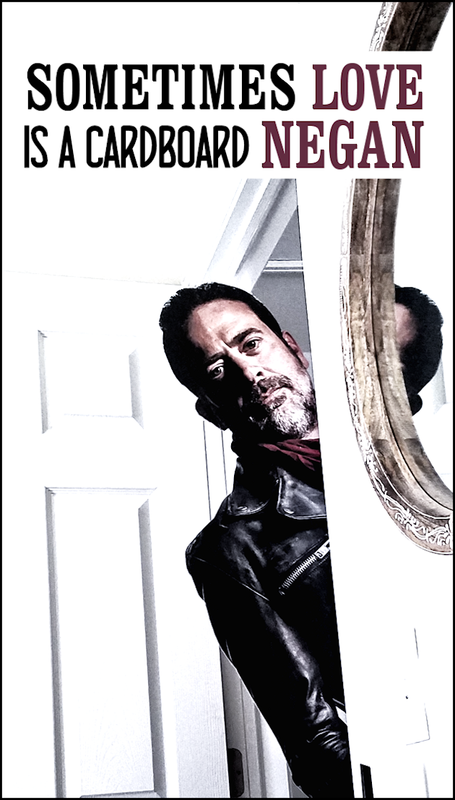 At the bottom of this post you will also find a short video showing how our dogs responded to motivational Negan. 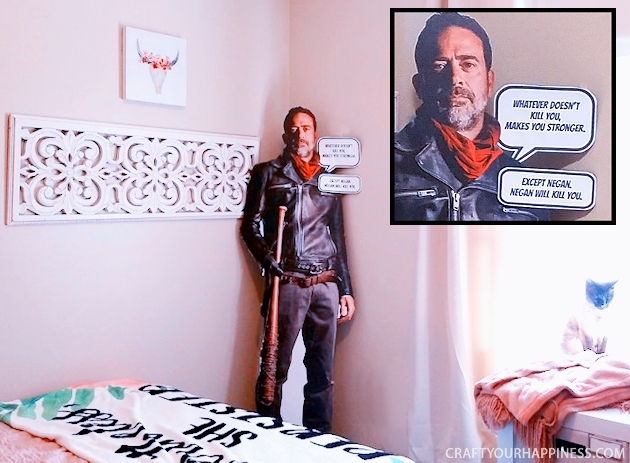 Download a free pdf of the speech bubbles shown on my Negan. I’m so sorry for your losing both of your parents and so close together. 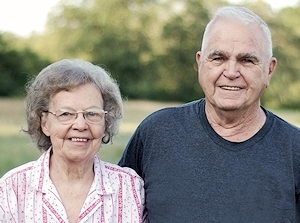 My dad is 90 and Momma is 85. Daddy has cirrhosis of the liver and liver cancer. Tomorrow we will find out how Y-90 worked on Daddy. My heart aches for you and although I don’t know you personally, I wish I could just give you a hug and let you know how much I care and that I’m praying for you. Our daughter is an only child. I couldn’t have anymore children after having 2. My first baby died and after being told that I couldn’t have anymore I was heartbroken. Jim and I were married for 8 years when I got pregnant with Sarah. That’s 33 years later, my miracle baby. Please remember that you’re never alone, people and that people care about you. Nancy, Thank you for sharing this amazing story of grief & love & family. I am sorry for your loss. My younger brother died unexpectedly in January of 2016, at age 45. Loss is painful. Don’t remember if I heard or read about the concept of “new normal”. Losing my brother changed everything. My life would never be the same. How could I “get back to my life”? Well over time, I saw that I wouldn’t get back to my life. I was still living life, but it was new and different. New normal. Keep taking care of yourself & receiving love! Hi Lauri, I’m sorry you lost your brother and at such a young age. This was my first real loss, and a double whammy, but I certainly agree. Life is about learning, growing and change. Thanks so much for your kind words. God Bless you and glad to hear you are on your way to Happier days! It is very hard to lose family but I always remember that Death is part of Life. The memories we have of those we have lost are always in out Hearts! Forever! Prayers are with you my friend!